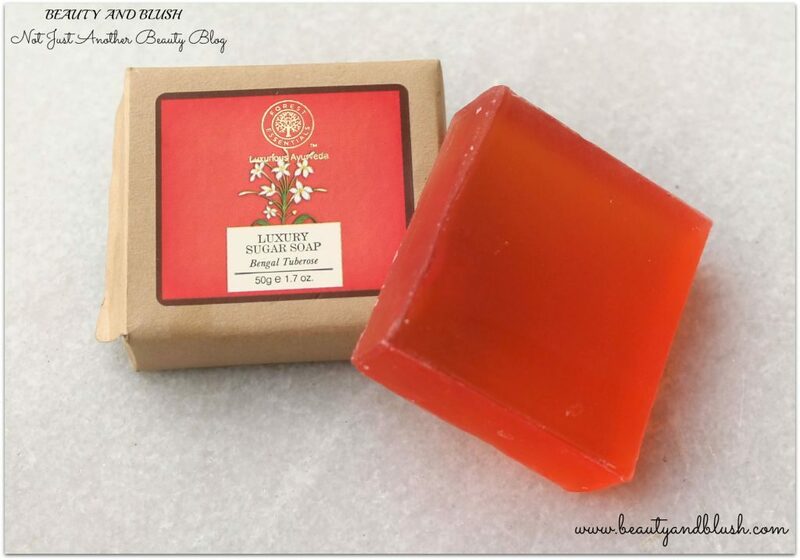 In my February edition of the Envy Box I had received the Forest Essentials Luxury Sugar Soap Bengal Tuberose. I had not tried a natural soap since a long time so I was pretty excited to try it out. These soaps are made by hand using the old fashioned cold compress. Our clear sugar soaps are made with pure unprocessed Raw Cane Sugar which is a natural humectant and helps to retain moisture in the skin. This Bengal Tuberose Luxury Soap is clear transparent soap with organic cane sugar, and adds natural oils to your skin. Apart from gently cleansing your skin, it helps to keep it soft and hydrated. The lingering scent of fresh Tuberose flowers leaves the skin soft and lightly scented. It is a harmonizing fragrance which uplifts the senses. Rs. 475 for 125 grams. I received a 50 gram sample soap. The soap comes in a simple brown paper packaging. Nothing great about the packaging. 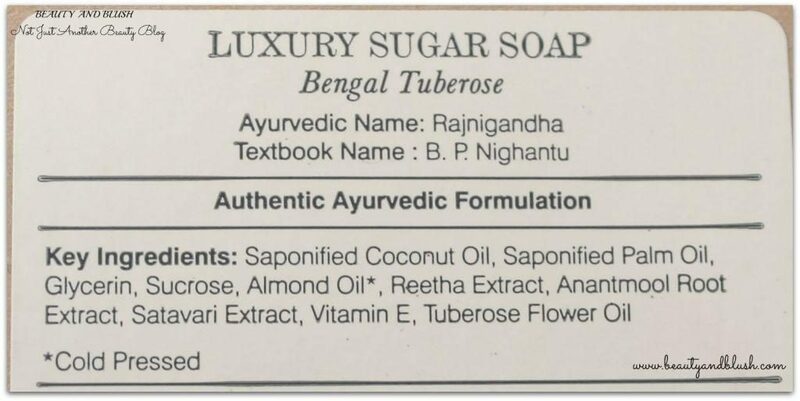 Where to buy Forest Essentials Luxury Sugar Soap Bengal Tuberose from? You can buy it from the Forest Essentials official website HERE. They also have stores in all metro cities so you can buy it directly from their stores too. I used this soap around 3 months back and I completely forgot to review it. 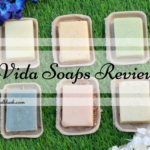 Yesterday while going through some of the pictures on my laptop I saw these soap pictures so I thought of reviewing it today for you guys.It’s been quite a while since I used a luxury all natural soap so I was really excited to try this one out. This is the first soap that I have tried from Forest Essentials and I must say that one has really impressed me. Forest Essentials products never fail to impress me, they are really so good. The soap is translucent and is square in shape. 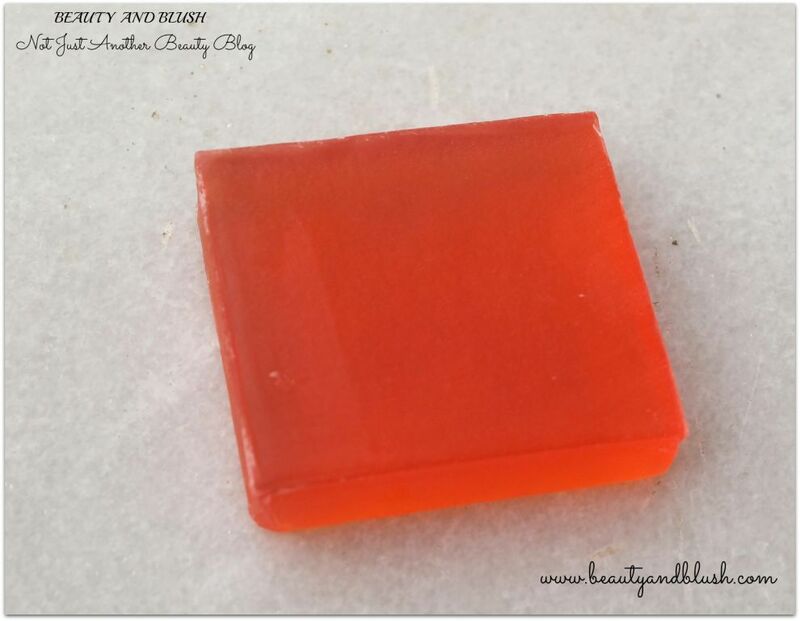 It is a beautiful bright sunset orange coloured soap bar. The soap lathers really well and cleans my skin without drying it out. It does not give me that scratchy or stretched out feeling after a shower. 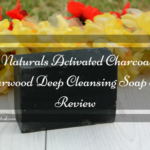 It is a very mild soap and does not rip off the natural moisture out of my dry skin. This soap is so heavenly smelling, I really can’t explain to you in words how it smells but it is a very soothing smell to the senses. It is a very natural smelling soap. This soap is naturally scented with tuberose essential oil. This soap smells like fresh Rajnigandha flower, nothing artificial or over powering, a very subtle smell which uplifts your mood. The smell of the soap lingers on my skin and in my bathroom for some time. It gives me a very fresh and awake feeling. This soap has a tendency to melt away very quickly so do remember to keep it in a dry place or in a dry soap dish post usage otherwise it is not going to last for a long time. I am really blown away with the quality of this soap but for a 125 gm soap bar Rs.475 is a lot of money, I’d rather spend on shower gel as it is going to last me for a comparatively longer duration. Nevertheless it is a really nice option if you want to try a natural soap inspite of the high price tag. I really like this soap and I will be trying some other variants from Forest Essentials. Does not dry out my skin. Gives a very refreshed feeling. Would I recommend the Forest Essentials Luxury Sugar Soap Bengal Tuberose to anyone? I would highly recommend it to all those who are looking for a all natural great smelling soap and who can shell out Rs.475 on a 125 gram soap. Would I repurchase the Forest Essentials Luxury Sugar Soap Bengal Tuberose? I would love to buy some other variants from Forest Essentials. Personally I also add the "Do I recommend and Will I buy" headings because they really add a human touch to the reviews! Jabe I am glad that you liked my post.Thanks for your suggestion sweetheart,I will really keep that in mind.Thanks a ton darling.? Jane these soaps are really worth a try,do try them,they are awesome. Ankita do try out these soaps, they are worth a try. 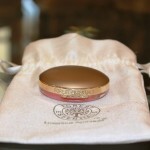 Forest essentials products are known to be luxurious. Wish the price was lower for this soap. Well reviewed Yamini. Yeah Safi FE products are really luxurious. I too wish that these soaps were a bit reasonably priced. Thanks a lot dear. This soap sounds so tempting to me!! Charu it certainly is a very tempting soap. 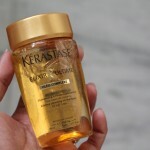 Thanks a lot Karishma.This soap is really worth a try.? Sonali it is really expensive for a soap to cost that much.Thanks a lot? Another soap from FE! wow.. BTW your finder nails are gorgeous! 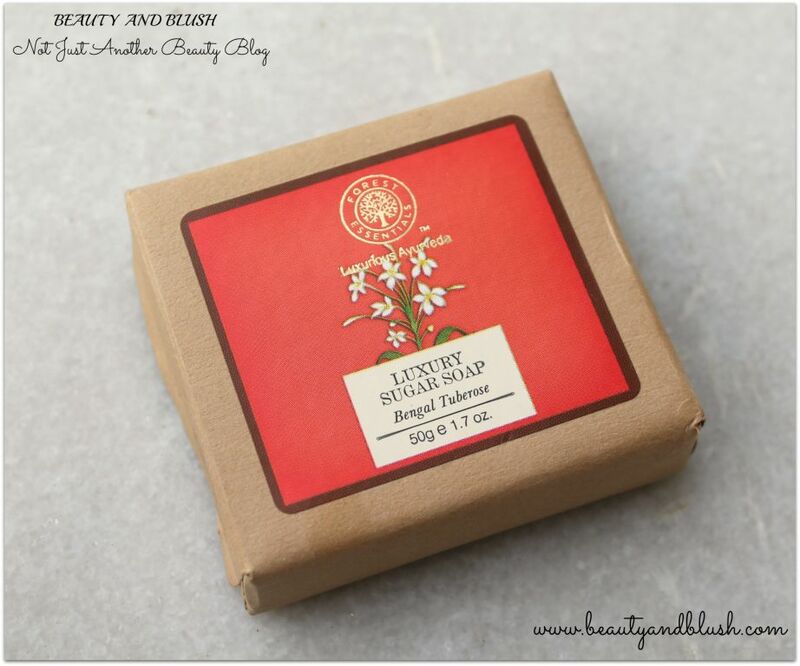 Ishita Ray recently posted…Spa Ceylon Lotus & Saffron Cleansing Bar Review| Yay or Nay? Ishita this soap from FE is really amazing.Thanks a lit dear,my finger nails have really grown a lot since I started a nail care routine,it has really helped me a lot….? Your review has intrigued me to try and smell Bengal Tuberose now. 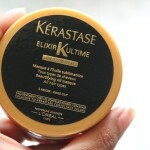 Amazing review and Forest Essentials as a brand seldom disappoints. Sneha FE products never disappoint me and this one lives upto its claims.You should definitely give it a try. Its indeed expensive for a soap! Agree with you on thia Megha.Really expensive for a soap to cost Rs475. Thripti I too am a body wash person,my favourites being from TBS.I too wish FE came up with their body wash instead.But this one is equally good. Yogita FE products are really droolworthy.This one is no different.Thanks sweetie.? Akansha this one is really impressive…Thanks a ton sweetheart.? Shwetali do try it out,it’s really good . Thanks dear. Mariyam it is really expensive for a soap to cost that much but definitely worth a try.Thanks a ton sweetie.? Taneesha I wouldn’t really spend Rs.475 on a soap,I’ll rather buy a bottle of shower gel but this soap is damn tempting.I will definitely try some other soap variants from FE.I too love the smell of Bengal Tuberose.Thanks a ton sweetheart.? Yeah Aiza it is a all natural soap so definitely worth a try.? 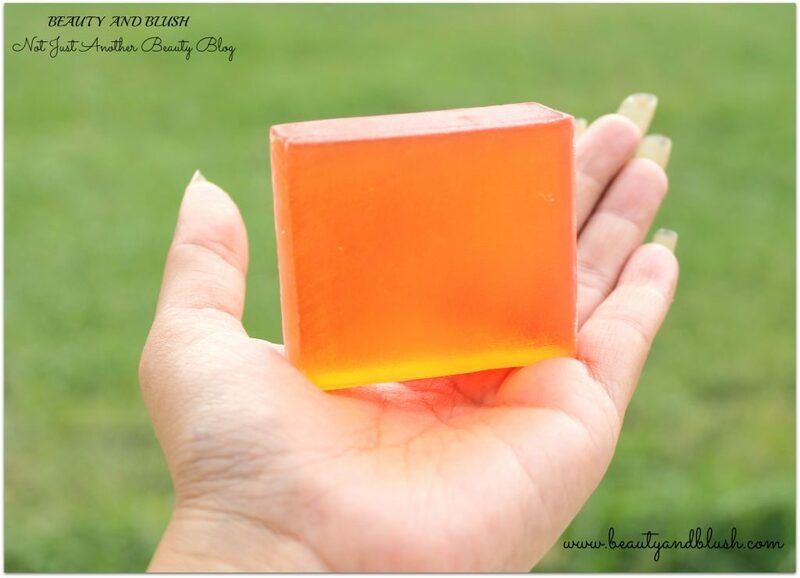 I have never tried any FE product, would definitely like to try out this natural soap bar 🙂 It looks so beautiful <3 Great review Yamini. Anamika FE products never disappoint you and this soap is a must try.Thanks a lot sweetie…? This is expensive for a soap… 🙂 Loved the review..
Yeah Anubhuti,it is expensive.Thanks a lot sweet.? Soumya it is tempting but yeah it really melts away quickly if left wet.Keep in in a dry place after application and it will last you a bit more.Thanks darling.? Maria this is an amazing natural soap, very mild on the skin. I agree with you on this Preety that the full size soap is really expensive. The one thing I am not too fond of FE soaps is that they melt away in a jiffy. Sangeeta I totally agree with you that FE soaps melt away too fast.But they are still worth trying.? Thank you so much Risha. ?